I guess I'm a little confused....the lining is stitched into place by hand? This seems a little time consuming if you could do it with the machine. Am I missing something in the process? I have everything cut out and ready to sew but I don't want to make a mistake. It's been my experience that every time I have stitched the stole by machine, it never lies flat. 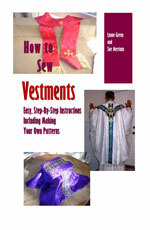 Unless you are an expert seamstress, you are likely face nothing but frustration machine-stitching your stole. Although it may seem time-consuming to hand-stitch the stole, you will save hours of frustration doing it this way.